What do you get when you combine a tour-preferred appearance with the ultimate performance accomplished golfers demand? You get 9 tour wins and a world-class reputation as being the #1 hybrid brand preferred by more PGA, Champions and Nationwide Tour pros, combined. * It’s sleek, hot and workable. The new Idea Pro Hybrid is engineered with high-performance design features for greater distance and versatility off the tee, in the fairway or out of the rough. In a nutshell, that’s why it’s the #1 hybrid on the three combined tours. • Sleek, tour-preferred design with no offset. • Low CG, highest MOI of any hybrid on tour. • Pull face construction with custom steel face creates lower spin and increased ball speed. • Adjustable weight port for swing weight and shaft adjustment. 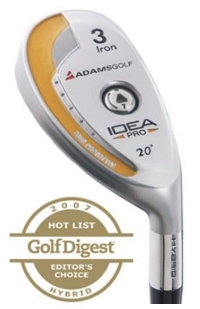 • #1 hybrid on Champions and Nationwide Tours, #2 hybrid on PGA TOUR in 2006. • Aldila VS “By You” hybrid shaft – the hottest new shaft on the PGA TOUR, with multiple tour wins.